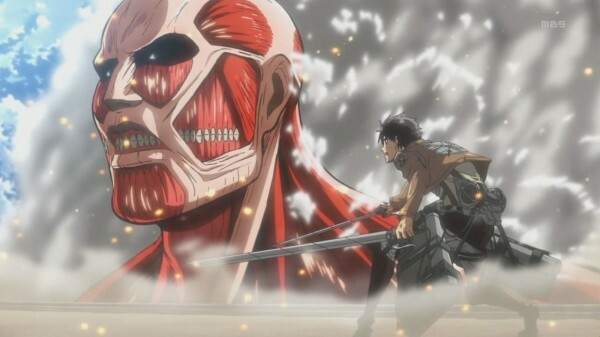 'Shingeki no Kyojin', or more commonly known as 'Attack on Titan', has made an incredible name for itself and has become a titan in and of itself. After having only one season under its belt, the series has skyrocketed to fan favorite almost immedeately. After it's initial Japanese release on Netflix, fans wanted more, and if you were one of the lucky ones to attend Anime Boston, you got to see the reveal of the English Dub of the series. Now, the English dub of 'Attack on Titan' is coming to Toonami-Cartoon Network's Saturday night Anime block on May 3rd. He vows to kill every Titan walking the earth. Eren and his surviving friends enlist to fight against the insatiable monsters. The future looks bleak, but there's more to Eren than meets the eye: he may be humanity's last hope against extinction. From the director of Death Note and High School of the Dead comes the series Anime News Network calls "an intense, visceral, and graphic thrill ride." The Titans have come to feast. Anything can happen. No one is safe. Attack on Titan comes to Toonami on May 3rd at 11:30pm.